As I got out of the car and looked around at the people and the bikes spread across the parking lot, tears came to my eyes. The generosity of people never ceases to amaze me. These people didn’t have to be here. These bikes didn’t need to be made. They didn’t need to bring all of these families out and provide them with FREE bikes and helmets. I could blame it on the pregnancy, but I’ve reacted like this when we’ve been invited to other events such as the Beaumont Christmas party. Unbelievable displays of generosity, love, caring, and support. Hard to see the many bikes but this entire lot was surrounded by volunteers, specialists, and bikes! As a physical therapy patient of Beaumont Children’s Rehabilitation Department, Colten is eligible for Bike Day and he is now old enough to get on the list. So we were invited to Bike Day this past weekend where Colten was able to sit on a couple different bikes, test them out, and find one that works for his needs. The entire event was quite incredible to see. I tried to take a picture of the entire lot but it’s very hard to see the actual bikes in this picture. There were so many versions and adaptive options throughout the lot – from pediatric hand-trikes to regular kids Trek bikes with extra-supportive training wheels to adult recumbent hand cycles and everything in between. Volunteers from Beaumont’s Rehabilitation departments were everywhere – checking families in, getting attendees fitted for helmets if needed, getting drinks and snacks to the other volunteers, helping situate attendees on proper bikes as well as fit them and help them test out the bikes. I’m not sure if Ambucs was the only adaptive bike company there, but they were the only one I noticed because they were the ones we worked with. After checking in, we were paired with Holly, Colten’s PT from when we first moved to the east side of the state and did his PT sessions in Royal Oak, and Jason, another therapist. We brought Colten’s own helmet and the fitters checked to ensure it still fit him, much to his disliking. He hates wearing his helmet and this little fitting resulted in about 10 minutes straight of crying until we got him on a bike and moving. After the helmet was on, we made our way to the pediatric trike section that had dual-mode cycle options (hand cycle and foot pedals combined into one bike) and single-mode cycles – both hand-only and foot pedal only. The best choice at this point for Colten is a dual-mode cycle because while he will mostly propel himself with his hands, yet we want to encourage the pedaling motion in his legs. That will give his legs movement and exercise. It is possible as he gets older he will also use his legs to help him propel. I would think to say he will always need a hand cycle and always need a trike-style (3 wheels) bike, but seeing as this child continues to prove me wrong time and again, I’ll just say that this is the type of bike we’ll start with and we shall see what he grows into! We started with a new model of the Amtryke pediatric trike. It was a NICE BIKE for sure. It was easy for me to push and steer from behind, but it was very heavy. And it wouldn’t be available until August. 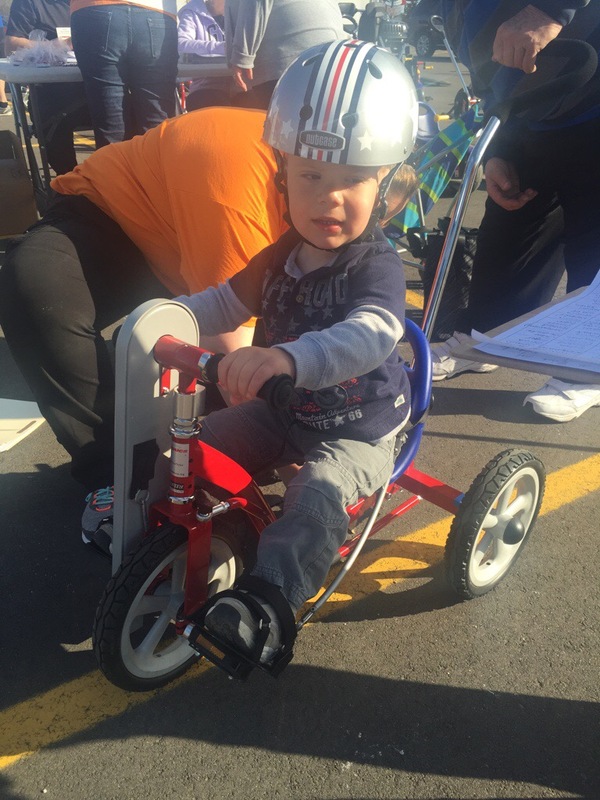 Then we tried a used bike – the current/outgoing model of the Amytrke pediatric trike. It was definitely lighter, but the steering capability was almost nothing. I could push with the handle, but could not maneuver it. The steering, just like most bikes, comes from the front handlebars, meaning Colten is primarily in control – however, he’s so focused on pedaling with his arms, it may take a little while until he can control BOTH propelling and steering with his arms. Then the Ambucs gentleman brought out a different rear wheel and seat configuration and attached it to the front end of the bike Colten was just on. This had a much better steering mechanism in it (not quite as nice as the newer model), didn’t add much additional weight to the bike, and Colten was able to take off with just a little steering assistance from me when he needed to turn. So that’s the setup we agreed would work best for him! The bike will be cleaned and properly refurbished for him, and we will receive it in late June / early July. The Ambucs staff feels with the condition of the bike and Colten’s size, we will most likely get only one year out of the bike. So next year, we’ll take that bike back to Bike Day and can use it as a trade-in for a new bike next year. This is a no-cost system for the recipients as long as we bring our bike back for trade-in! We are incredibly thankful to be a part of the Beaumont system for Colten’s therapies – great people, wonderful service, amazing opportunities. THANK YOU Beaumont and Ambucs! This entry was tagged adaptive bikes, ambucs, amtryke, Beaumont, physical therapy, spina bifida. Bookmark the permalink.